I am by no means an expert foodie, but I do love food. Especially crab legs and macaroni and cheese. My love affair with cheese goes way back to the days when I was just knee high to a grasshopper. But, crab legs. Well that…I didn’t know about that lovely piece of fluffy goodness until much later in life…I digress. I’ve been to the nation’s capital multiple times, but never really tried any of the cuisine in the area. 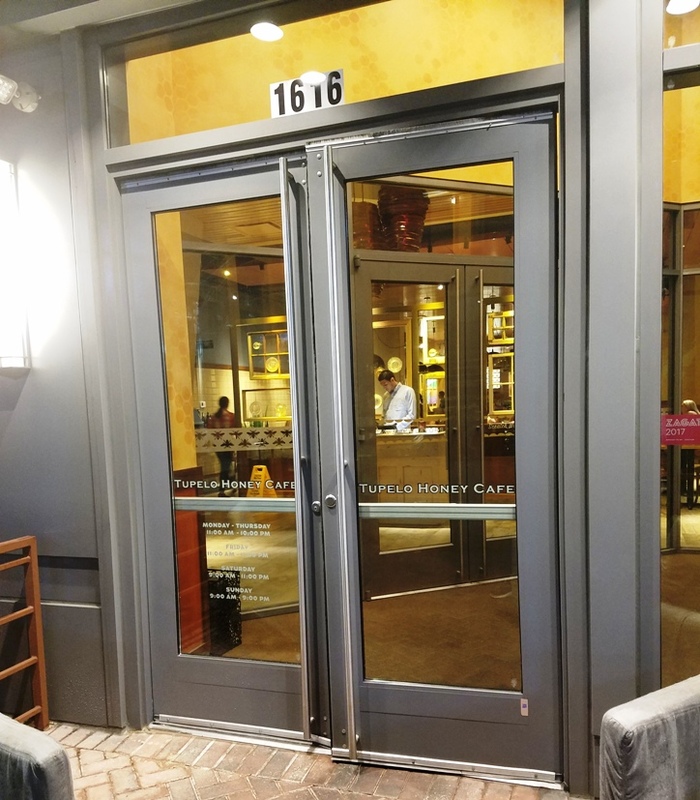 On my most recent trip to visit a friend and go to the Smithsonian National African American museum, I decided to chronicle a few places in and around D.C. that you might want to dine at if you’re ever in town. This restaurant is located in Arlington, Va, just a few minutes outside of D.C. When we strolled up to the establishment, the first thing I noticed was how diverse it is. There’s the dining area, what looks like an area for pool and a traditional bar, and then a rooftop tiki bar with live music. I think there’s something for everyone here. My friend raved about the mac n cheese at this place and naturally, I had to try it for myself. The only thing was that there were so many things I wanted to try, but clearly I couldn’t eat the whole menu. What’s a girl to do? I created an unconventional meal. Listen, I already told y’all I have a thing for crab and an order of the mini crab cakes appetizer was ordered. I’m a sucker for sauce. If you pair the right sauce with food, magic can happen. Whitlow’s was off to a great start for me. 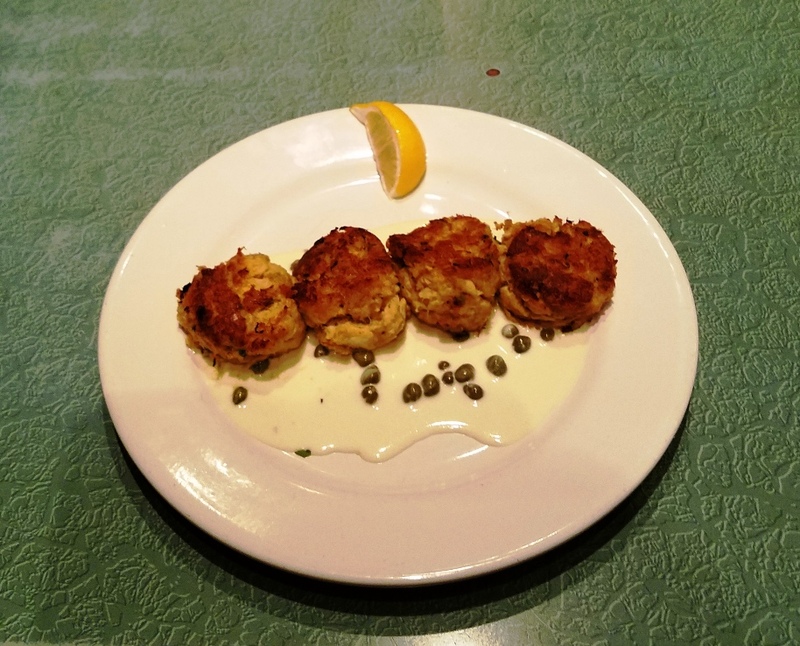 The crab cakes did not disappoint. On to the entrée. 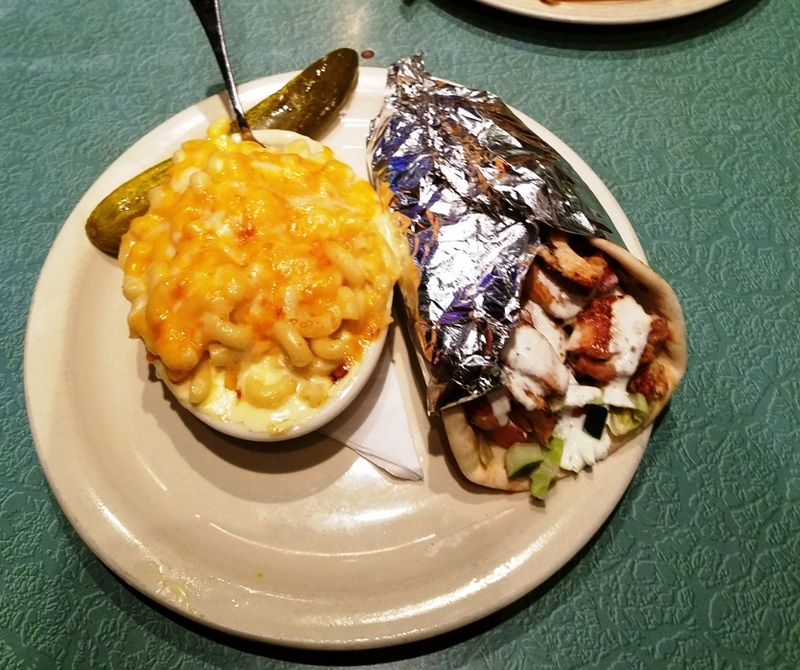 I ordered the chicken gyro and substituted the fries for the infamous mac n cheese. We wait…. for longer than we should have, but the food didn’t let me down. Let me tell you about this plate of glorious deliciousness that was placed before me. You could probably find a gyro at a lot of places and I’ve had gyros in a lot of places. I’ve even had one in Greece. This is one of the better ones I’ve had. Ever. But the highlight of the night was the beautiful mac n cheese. I’m salivating at the mouth just thinking about it. I know mac n cheese. You can ask my mother. It’s my thing. I want it even for holidays where it’s not traditionally served, like the 4th of July. Doesn’t matter. I want it. This was the cheesiest, gooiest, most succulent mac n cheese I’ve had in my life and I’ve had A LOT of mac n cheese. I would have been happy to just have the mac n cheese. It’s that good. If mac n cheese is your thing, you have to try it here. Trust me. It’s that damn good. I may or may not have mentioned my obsession with crab legs. I mentioned this to my friend and I was whisked away to this self proclaimed Florida style seafood shack. This place can get packed fast and there isn’t much room for dining in. It looks like a small one story house that was converted into a small restaurant. By the way, my crab legs caving was fulfilled for the day. CrabBoss is legit. Let’s start with the price. It’s very pricey. I’m from Texas and I can get crab legs by the lb. Here, you pay by the crab legs/cluster. Things can start to add up quick if you want more than one cluster or if you have a custom order. 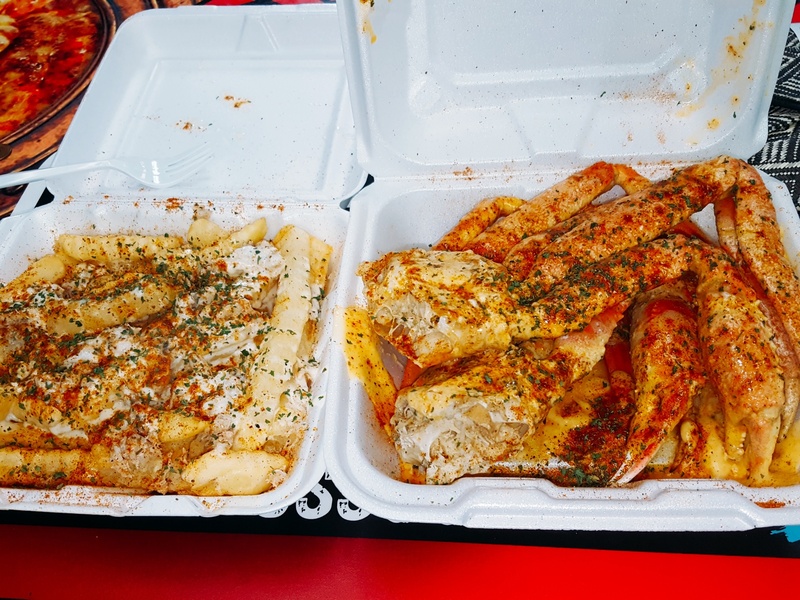 I shared an order of two crabs and the boss fries. What are boss fries? Well, I’m glad you asked. Boss fries are French fries topped crab meat and house made cheese sauce. 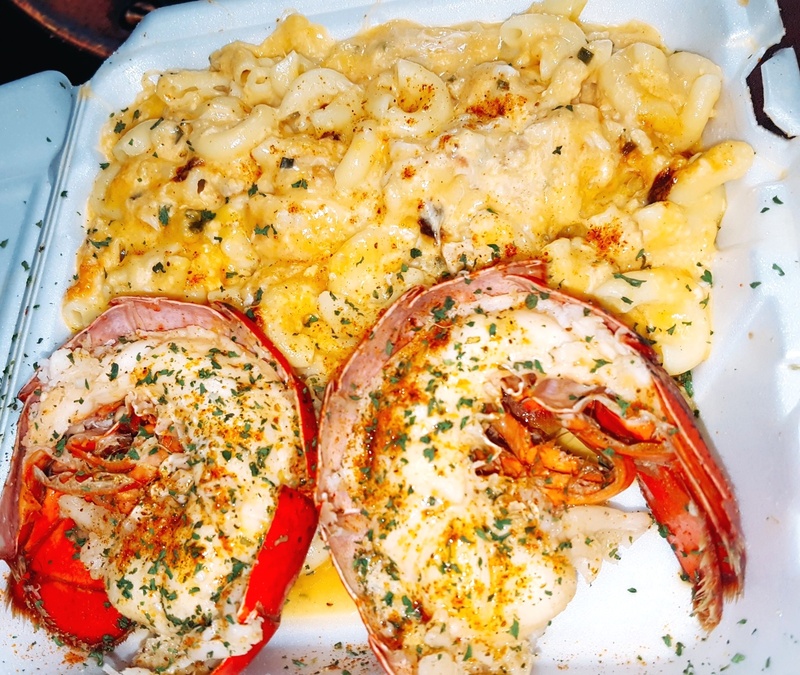 I order the special seafood mac n cheese with a lobster tail also. Don’t judge me. I told ya’ll about my affinity for mac n cheese. Everything is topped with the Crab Boss sauce. What I can tell you is that this sauce will have you licking your fingers. The seafood mac n cheese was divine. The hands’ of the preparers of this meal are touched by angels. I’m convinced. It may have been pricey, but it was well worth it. 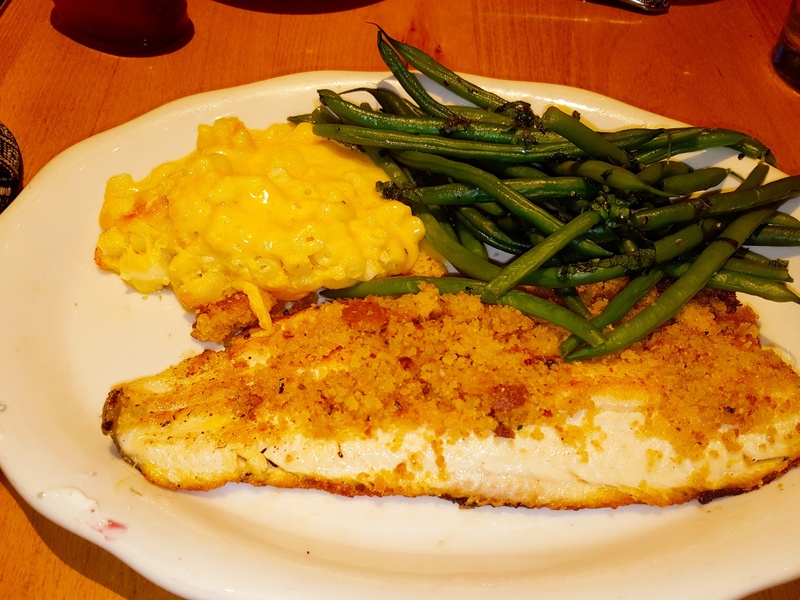 Tupelo is the one place my friend has been wanting to try since moving there as a lot of her friends have raved about it. I’d say Tupelo is a restaurant where you can tell the food is fresh. 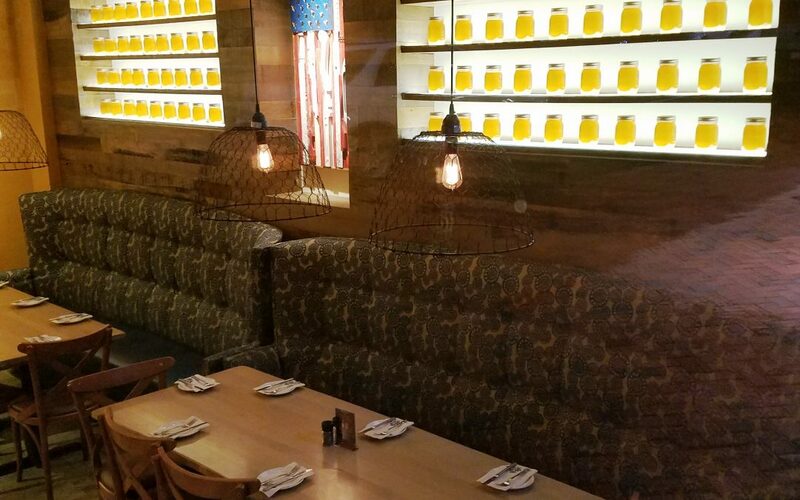 This establishment touts itself as a restaurant that serves Southern food with a little bit of a twist using responsibly farmed food. The food speaks for itself. The service was great. The manager went out of his way for my friend and I as first time diners. 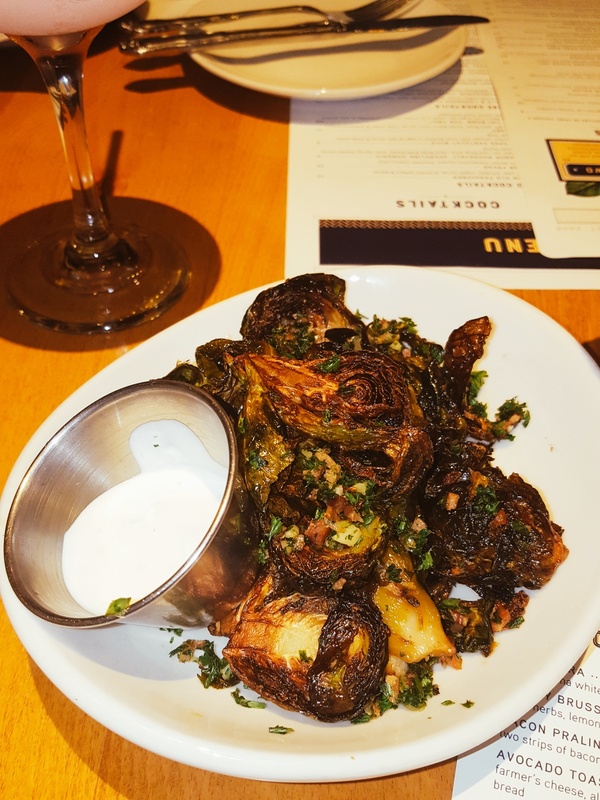 When our server asked for our order, we wanted to try the crispy brussel sprouts, but the manager had already ordered one for us on the house! (He was super sweet!) Biscuits for the table is standard. I ordered a frozé and sangria. Both drinks were wonderfully tasty. And now, for the main attraction. I ordered the recommended red wine glazed short rib. I. Loved. This. Dish. The short rib was cooked to perfection. The meat was juicy, tender, and melted in my mouth. 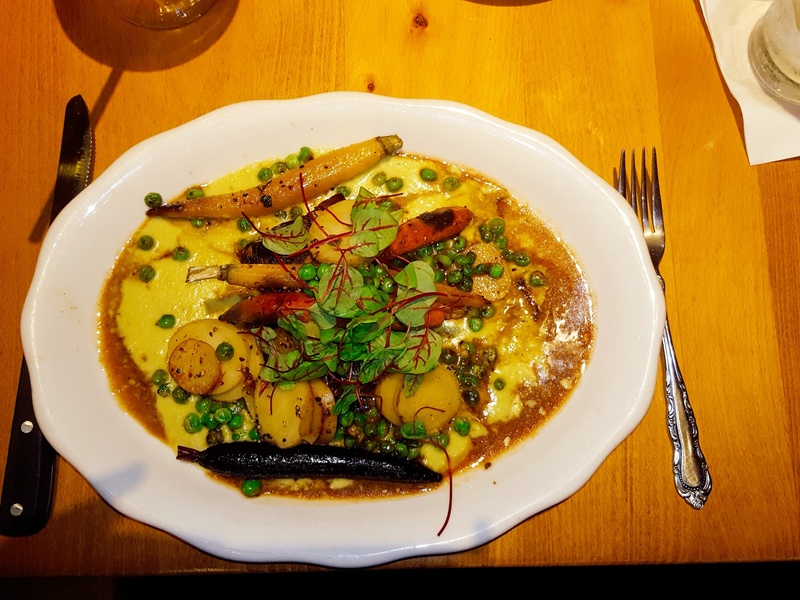 The tri-colored carrots and fingerling potatoes were a perfect match, finished with spring pea cream. Now, I’m not a fan of peas, but it didn’t ruin the dish for me at all. I just pushed those bad boys to the side and dug all the way in and cleaned the whole plate. I even used some of my biscuit to sop up the plate. I’m not shamed at all either. There was mac n cheese on this menu too, but my friend ordered it with her entrée and I just had a small bite. It’s good, but I’m partial to Whitlow’s. If you go to Tupelo’s, I don’t think you could go wrong with anything on the menu. The smells that were coming from the kitchen gave me confidence that no matter what I ordered from the menu, it was going to be delightful. I just happened to order one of the best meals they have. 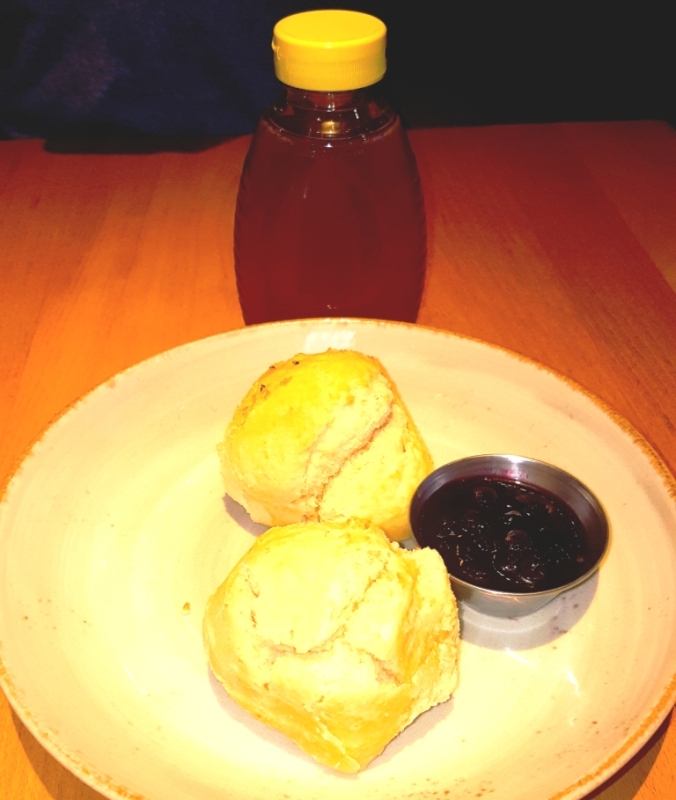 I think from what I’ve gathered, there are mixed feelings about Founding Farmers. Of course, I had never been and my friend had only been to the location in Arlington. It was new for the both of us. We had the most cheery waiter who told us his story about serving Justice Sotomayor. I was officially jealous. I’m a lawyer and the judges are my celebrities. Back to the food! My friend ordered the skillet cornbread and the crab dip. 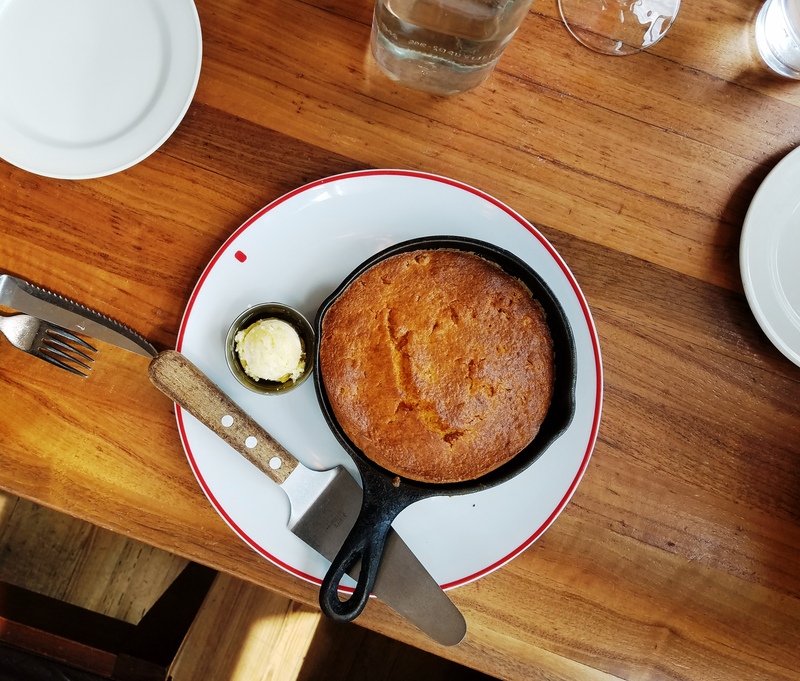 The cornbread would have been ten times better without corn in it. 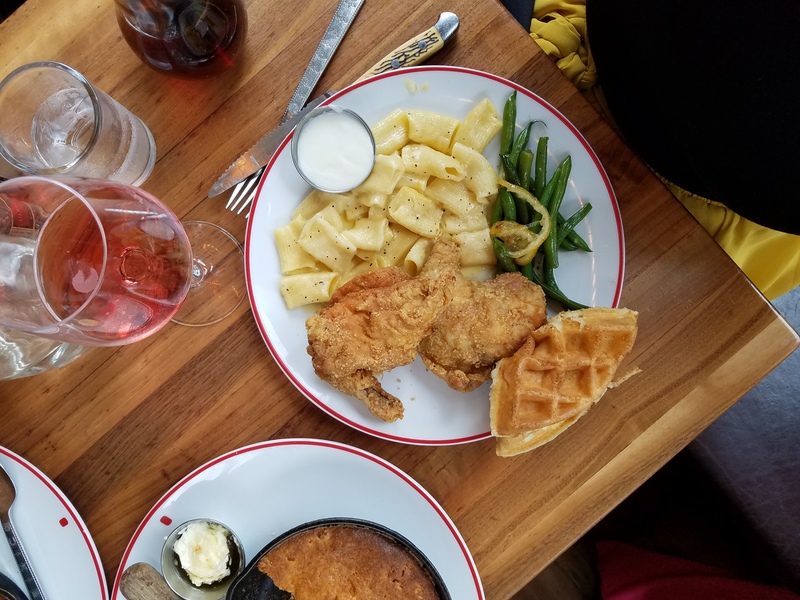 I was feeling brunchy and ordered the tried and true chicken and waffles which came with green beans and mac n cheese. I swear I didn’t request it this time, the meal comes with it already. What I liked was that I didn’t feel like I needed to unzip my pants and let it all hang out from being overly stuffed. The mac n cheese isn’t anything to write home about, but just put a dash of salt and pepper on it and it’s fine. The chicken and green beans were the better part of the meal for me. The waffle was okay. Over all, I really wanted to go here for brunch, but we didn’t make it before 2 p.m. So, I can’t speak to anything else on the menu. The food was good, but my friend tells me the Tyson location is much better. She goes there’s a lot. I’ll take her word for it. There are plenty of other restaurants and dives to dine in DMV and I’d like to try others, but this go around, I only had 3 days in town and I spent almost an entire day at the African American museum which was completely, totally worth it. If you are in the DMV area, try these places out and see how you palette feels about them. For sure go to Whitlow’s for the mac n cheese and get those crab legs if you can handle the drive to Maryland. Have you dined in and around the DMV? What are some of your favorite places to dine? Let me know in the comments below! Looks like you explored many amazing dining places! I’m going to DC next week and would love to explore few of them that you suggested! Please do! For sure try Tupelo and Whitlow’s. 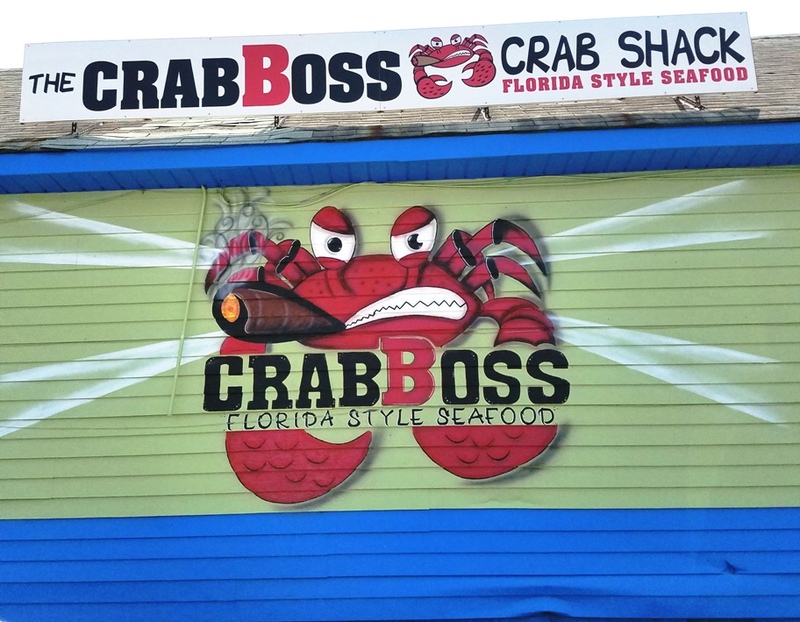 You have to drive a bit, maybe 25 minutes for Crab Boss, but if you’re able to, I’d try that also! There seems to be very many nice places to dine at over there! Should check these out next time I am over there.